For those of you who are curious about why I am venting my frustration at Vodacom on Twitter well it all started on the 21st or 22nd November, can’t remember exactly which when I logged into Vodacom’s web portal and changed my banking details to my FNB account and the debit order date. I logged back into the portal on the 25th November to amend the debit order date and was shocked to see that my account details displayed a Nedbank account. 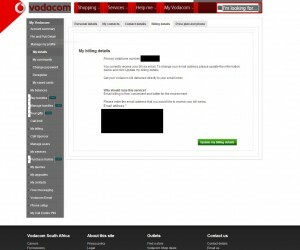 I immediately changed it back to FNB and alerted Vodacom through their social media and dept. I got a few calls from various people but the outcome was that they had checked with their engineers and it was an isolated problem and there was nothing to be concerned about. I countered that this could be a serious bug or even worse a cross linked database and that if my account had someone else’s details there account may have had mine. Again I was assured that this could not be the case. Low and behold, come the 11th January I get an in contact message from FNB about debits coming off my account and see two debit orders from Vodacom, one listing my account number and one for R1900 listing someone else’s account number. The other person is lucky I changed my details otherwise my larger bill would have gone off their account. I immediately brought this to the attention of customer care who are so useless it’s scary and then reverted to a contact I have who got some very concerned people to contact me. They confirmed that there had indeed been the very situation I warned them of and were checking to see how wide spread it is. Let me stress again that they were warned about the problem and they ignored it… They could have tested the code which would have more than likely reproduced the error but they chose to do nothing. Since yesterday the facility to update your banking detail was removed from Vodacom’s portal which indicates it is more than just an isolated incident and would tend towards there being a bug in their code but it could still also be a database cross link which is very very bad. Sreenshot above showing the removed option to update banking details. What this in effect means is that a large number of people who updated their details via the web portal could in fact be paying each other’s accounts. Apologies to those at Vodacom who I know and who are helpful but others promised that the money would be refunded yesterday so that I would actually have money in my account to pay for things I need to pay for before my suppliers close on Friday, but there has been no further follow-up from Vodacom or any of those who assured me that this would be rectified, there is no money in my account and all Vodacom channels are avoiding me, so Vodacom now is all out in the open and try avoid this! As a company you have a lot to learn about customer relations and transparency. For those reading this, as I said on twitter, if you have updated your account details recently using the web portal I would seriously go check the amount that was debited against your most recent invoice. Yesterday after writing this, I was finally called by Vodacom social media who assured me that my account had been credited. I pointed out that that didn’t do me any good as I needed the money paid back to me and was assured that this had been done. As of this morning, Friday the 13th, no money has been paid back to me and Vodacom still retains my money that they took from my account illegally. Vodacom just don’t get it. Just had an altercation with an accounts dep. supervisor. I was informed that Vodacom has systems and I must be reasonable and wait for those systems to run their course and what do I expect, that they will just go to the bank, draw cash and deposit into my account. So its ok to just take money out of my account but I must be reasonable and wait for them to return it?